If this pie were a person, it would be a beast of a man. A red flannel shirt wearing, 6ft4 lumberjack. Shoulders so broad they barely fit through doorways. Constant gruff stubble on his chin and a growl to his voice. He’d smell like a mixture of clean laundry and mud, and his laugh would make your beer tremble. But of course he’d still know how to treat a lady right, this is a rough tough gentleman‘s pie after all. The mixture of steak, Guinness and seriously strong cheese make the most incredible, rich pie filling, while the pastry is the perfect buttery, crispy, soft vessel for all that gravy. I make this for my dad and brothers for brownie points (but really I make it for me as it’s my absolute favourite). The only thing that’s a little bit tricky about this recipe is the pastry. I make Leith’s Rough Puff Pastry but you could always speed things up a bit by buying really good ready made puff pastry. I like to make my pie filling the day before I make my pie. This way it has all night to mingle and get delicious in the fridge. It’s also much better for baking the pastry, we don’t want any soggy bottoms. Add a glug of olive oil to a large saucepan over a medium heat. Once it’s hot toss in your onions. Fry until soft and then add your carrots, parsnips, mushrooms and garlic. Mix it all together before adding your beef, salt, pepper and rosemary. Turn the heat up a bit and fry it all together for about 5mins. When the meat’s gotten a little colour, add your flour and pour in your Guinness. Simmer for a few mins before covering and throwing the whole thing in the oven. Leave it bubbling away for at least 2 hours, stirring now and then. This is going to make your kitchen smell awesome. After about 2 hours remove your pot and put it back on the hob without its lid to reduce the sauce. When you’re left with a pretty robust, thick sauce, you should be done. Put the filling to one side to cool down and then pop it in the fridge over night. The most important thing with pastry is to keep everything as cold as possible. Open the windows, hold your hands under the cold tap and dry them and clear a mixing bowl sized space in the fridge before you start. â¨Sift your flour and salt into a large bowl. Using a table knife, toss the butter cubes with the flour. Sprinkle about 12 tablespoons of water over the flour while stirring quickly with your table knife so that the paste clumps together. Now use your fingertips to Gather the lumps together, leaving any dry mixture in the bottom of the bowl. It will look hideous. Flour your surface and mould your dough into a rectangle. Now start rolling it out. (I used a marble rolling pin but you could always use a cold (dry) wine bottle, just remember to cover it in flour first.) â¨ Roll it out so it is 3 times as long as it is wide. Fold it over itself like you would do with a business letter. Press the edges of the pastry gently, like a gentle judo chop (to seal the air inside). Turn it around so it looks like a closed book you are about to open. â¨Do this again and again until your pastry starts to look smooth like this. Now fold it up again, cover with one of your butter wrappers and pop it in the fridge. It needs at least an hour, or you could leave it over night like I did. â¨ When you’re ready, you’ll need to divide your pastry into bottom and lid. Pop your oven onto 190ÂºC/375ÂºF while you’re at it. Put your lid to one side and roll out your bottom. It needs to be big enough to cover the inside of your pie dish and not too thin. 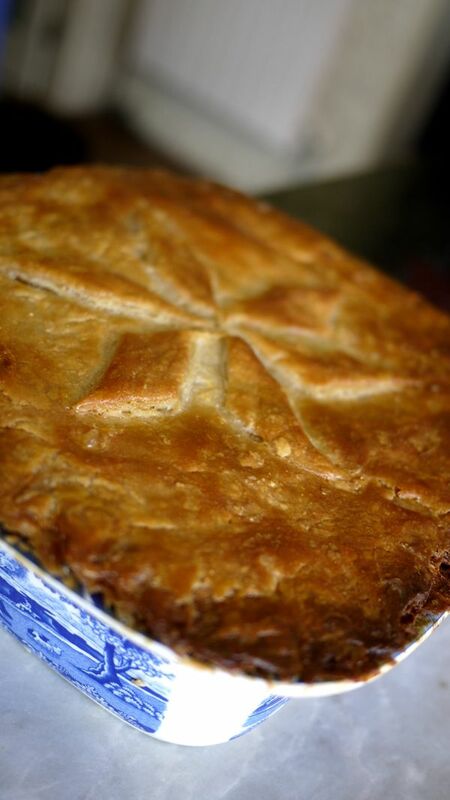 Use your fingers and a little bit of water to wet the rim of your pie dish under the edges of your pastry so it sticks. Then cut off the excess pastry and put it to one side (you can use this to make your decoration). Because you’re making quite a big pie you’ll want some structural support. If you don’t have a pie funnel you can always use an upside down egg cup. And sprinkle with your extra strong cheddar. Roll out your lid and place on top. Seal it to the bottom with a little water along the edge and cut off the excess. Use the bits left over to make your decoration, I was lazy and made leaves but you can be as inventive as you like! Make a little hole in the very centre (into your funnel/egg cup). Pinch the edges. Brush with your beaten egg. And it’s ready for its sauna! Pop it in the oven for 40-50mins, checking that it doesn’t burn. When it’s ready it should be golden brown with beautifully crackly, butter pastry. Serve with peas and cold pints of Guinness. One pie should feed 4-6 people depending on how hungry you are, but if you served it with with a big bowl of buttery mash and a little extra gravy you could easily feed 8. .